Cast: Anthony Hopkins, Anton Yelchin, Hope Davis, Mika Boorem, Will Rothhaar, Alan Tudyk, David Morse. God save us from soggy nostalgia. Hearts in Atlantis, an early bid in this year's Oscar race, tries vainly to capture the coming-of-age spirit that played so well with Liberty Heights and Stand By Me. It's a lazy, unfocused, long summer afternoon of a film, full of good ideas that never get properly developed. Director Scott Hicks sets out to create a bittersweet meditation on lost youth, contrasting the joys of Eisenhower's America with the dark underbelly of postwar prosperity. But he ultimately becomes so enamored with his ephemeral phantoms that he forgets to deliver anything of substance. Following the death of a childhood friend, photographer Bobby Garfield (David Morse, always welcome) returns to his Connecticut hometown, there to lead us through the requisite flashback-to-younger-days. Suddenly, it's the summer of 1960, where the economy is strong, a woman's place is in the home, and an 11-year-old Bobby (Anton Yelchin) pals around with best buds Carol (Mika Boorem) and Sully (Will Rothhaar). They run merrily through the streets and catch fish down by the crick while a predictable gamut of golden oldies play over the soundtrack. Bobby's summer takes a turn when his self-absorbed mother (Hope Davis) takes on a mysterious lodger named Ted Brautigan (Anthony Hopkins) who has both secrets to hide and wisdom to impart. Hopkins' character proves simultaneously the most interesting and most problematic element in the film. He and Bobby befriend each other, giving the boy his first legitimate father figure and opening him up to the wide world beyond the front door. But Brautigan also has problems: startling psychic powers that have made him a target for shadowy government agents. Bobby's house is just another waystation in a neverending run from the "Low Men," Fedora-ed silhouettes who hover on the edges of vision. He asks Bobby to keep an eye out for these mysterious enemies, knowing that his time may be running out. Suddenly the Wonder Years atmosphere takes a plunge straight into The Twilight Zone. The disparity between the psychic subplot and the rest of the film is not as wide as it first appears. Hicks seems to have a handle on it in the early scenes, and there's a definite thematic connection between the sinister Low Men and Bobby's fading innocence. But it's a delicate balance and as the film progresses, it becomes clear that Hicks doesn't know how to maintain it. He tries to play coy with Brautigan's abilities -- do they really exist or is Bobby just imagining them? -- but we never really question their authenticity. Brautigan knows things he clearly shouldn't and capitalizes on his flashes more than once. Having rooted his powers firmly in the plot, Heart in Atlantis then abandons them, leaving nothing beyond some convenient deus ex machina to remind us they exist. The Low Men linger nicely on the screen (credit late cinematographer Piotr Sobocinski for some outstanding work here), but fail to have any real impact on the plot. It eventually becomes cut off from the rest of the film, a strange appendix in dire need of removal. Hopkins delivers a decent performance, but it's the kind of role he can do in his sleep. The material never challenges him, and he seems content to coast along until his check clears. It's like watching a thoroughbred pull an apple cart: you know he can do better. The same could be said for the film as a whole. The coming of age material plays painlessly enough, but lacks any real dramatic depth. Stephen King, who wrote the original novel, has written the same story before, both with fright masks (It) and without (The Body). Here, it feels used and shopworn, a few nice moments that never amount to anything. Hicks has enough sense to tone down the schmaltz, but his efforts also rob the film of any dramatic punch. We simply slide from one incident to the next, with no build-up and very little resolution. Presumably, there's some larger point to it all, but without something firmer to pull us along, we just can't care. 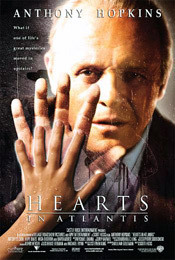 Hearts in Atlantis uses a recurring visual motif of characters gazing through curved glass. It's apt summation of the film as a whole: distant, hazy, sometimes pretty but never really compelling. Even sun-dappled nostalgia needs something to run on, and Hearts in Atlantis just doesn't have any meat on its bones. I know it's been a grim year, but this is not the cure for our cinematic blues. Let's hope something better comes along. Soon.